WHAT IS IT? 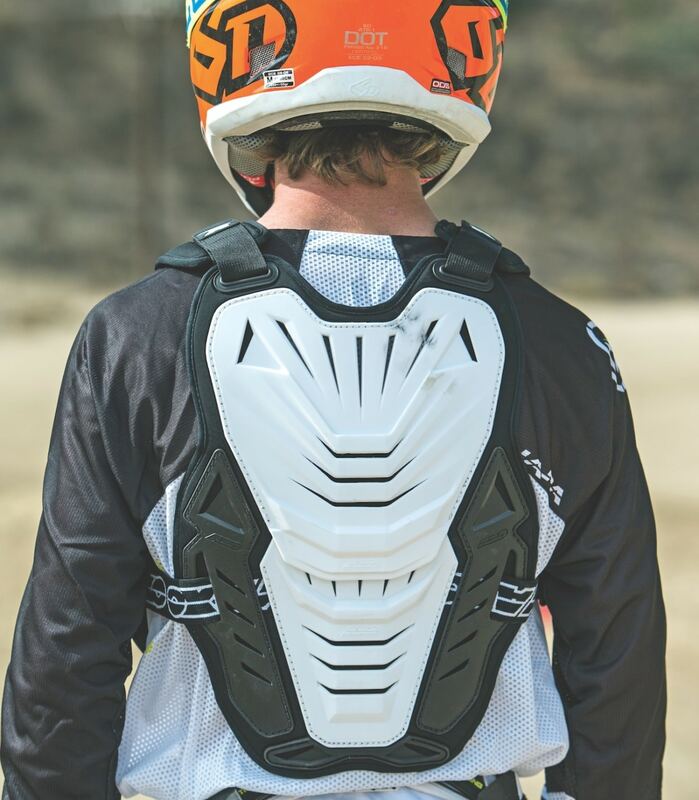 Most chest protectors are bulky—not the AXO Pentagon Bio-Frame roost guard. 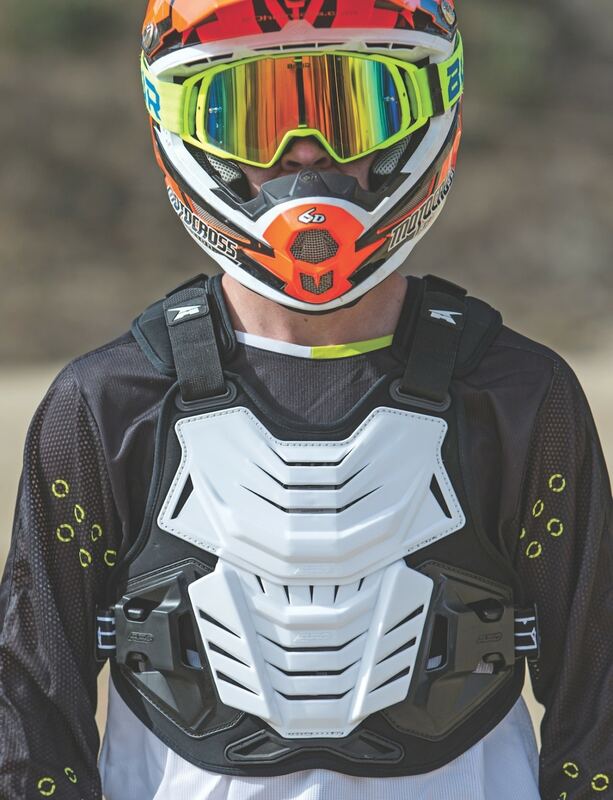 It’s a one-size-fits-all design that is the minimum protection that every motocross racer should wear. WHAT’S IT COST? $95.99 (one size fits all). CONTACT? (800) 409-0903 or www.axo.com. WHAT STANDS OUT? Here’s a list of things that stand out with the AXO Pentagon Bio-Frame roost guard. (1) Concept. 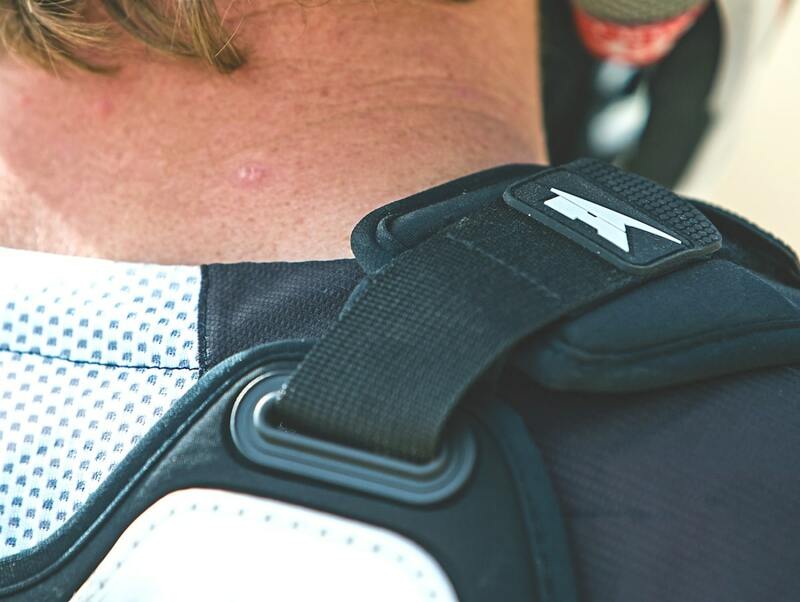 Many riders don’t wear chest protectors because they find them too bulky. Or they want to be manly. To avoid looking fat, many riders resort to fabric under-protectors or go naked to the world—at least when it comes to upper body protection. This is where the roost guard comes into the picture. The classic roost guard of the 1970s was a Hallman GP chest protector. It was a blue-and-yellow front-only protector that was the precursor of the modern fabric under-protectors on the market today. It was replaced in popularity by JT Racing’s plastic roost guard. It had space-age looks and mimicked the front-only coverage of the Hallman GP. The JT Racing roost guard joined the incredibly popular HRP Flak Jak, which combined a plastic roost guard on the front with a plastic back panel and air-bag shoulder cups. Today’s riders wear an ancestor of the Flak Jak but without any shoulder protection. The modern roost guard, as represented by the Thor Sentinel, Fly Revel, Alpinestars A1, Fox ProFrame and AXO Pentagon Bio-Frame, are plastic clam shells with adjustable shoulder straps. They are easy to put on, offer chest and back protection, and can be worn under or over a jersey without adding too much bulk. (2) Protection. 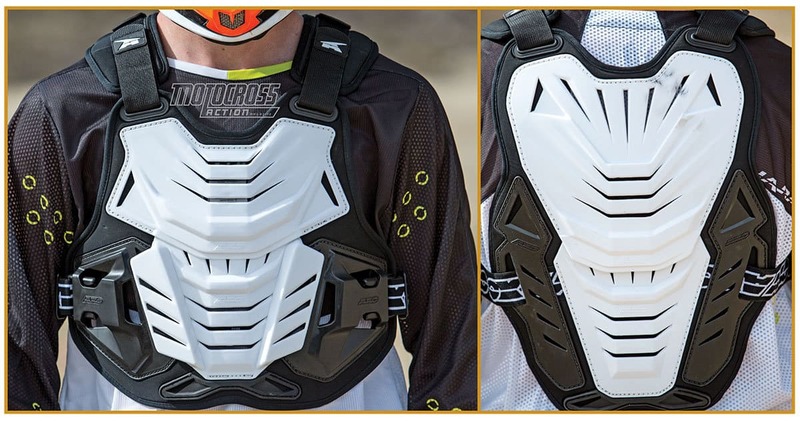 There is a technical difference between a roost guard and chest protector that is lost on the masses. The typical roost guard is CE-certified with an EN-14021 rating. The CE certification refers to how much energy the front and rear panels can absorb. Most EN-14021 roost protectors are classified as “stone shields.” That means they are effective at knocking down roost but not effective at absorbing heavy impacts (for that you would need a chest protector that was CE-certified with an EN-1621-3 rating). (3) Fitment. If you are over 200 pounds, wear the AXO Pentagon over your jersey. Additionally, if you are interested in more torso protection to lessen crash-induced trauma, skip the Pentagon Bio-Frame for the EN-1621-3-rated AXO Pentagon Morpho; its plastic and foam padding are three times thicker. Adjustment on the Pentagon Bio-Frame is simple; an elastic strap goes around the waist and hooks to the front panel, while Velcro straps cross over the shoulders to allow up and down positioning of the front and back panels. (4) Added features. “Bio-Frame” has been added to the Pentagon moniker because the under-layment of the plastic piece is made of Bio-Foam—a soft, molded, cushioned foam liner that is easy on your skin. The front and back panels come with separate folding pieces so that the plastic can conform to the arch of your back or the bulge of your tummy. It comes in two colors—white-on-black Bio-Foam or black-on-black Bio-Foam. Finally, it is neck brace compatible. (5) Modular. There is an optional Y-strap that can replace the rear plastic panel for those who want a front-only roost guard. WHAT’S THE SQUAWK? We had no major issues, because clamshell roost guard technology has been around since the 1970s and thus is hard to get wrong. MXA RATING: Face it, a polyester jersey is no protection against a rock traveling at 40 mph towards you. You protect your eyes against flying debris with goggles, your skull with a helmet, your hands with gloves, your knees with knee braces and your feet with heavy boots; doesn’t that beer belly (or six-pack) deserve the same care?